Just like any new business venture, starting your Facebook ad agency from home is, without a doubt, is no easy task. You want to have a roster of clients right from the start. And, at the moment, you’re hustling and putting in just the right amount of elbow grease to work your way up to a full-blown agency. But, want to know what comes with reaching that milestone? 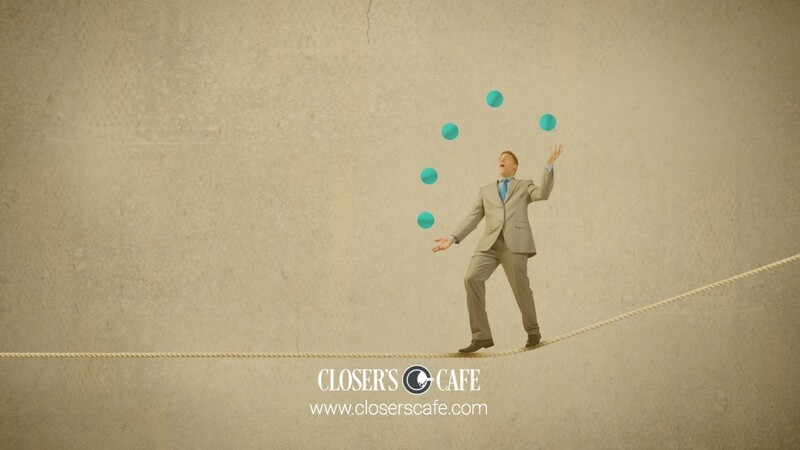 The client juggling act. And, do you know how difficult it can be to juggle a handful of clients on your own, while continuing to be laser-focused on providing outstanding, reliable service? Actually, it’s only difficult if you don’t have the tips you need to learn how to do it successfully and with grace, ensuring no client gets dropped. Ouch. That would hurt. So, how do you actually manage a Facebook ad agency with five or more clients? That’s a popular question many people first starting out want the answer to so they can take the necessary precautions to avoid dropping the ball down the road. Hence the reason why I’m here today—to share with you our top-notch ways to help you kill it at managing your Facebook ad agency as your roster continues to grow. Now, you’ve got no excuse but to keep that momentum going! 1. Maintain a digital ad calendar. Here’s a question for you: do you find it essential to your success (and sanity) to use a calendar—whether digital via iCal or Google—in order to keep track of your to-dos, meetings, and other important events? If you said yes, I’m with you 110%. And, if not, I want to know your ways because you’re one seriously talented individual being able to keep track of everything upstairs in that brain of yours! What I’m trying to get at is, if everything is starting to mush together, and you’re having trouble memorizing deadlines and seeing the big picture of each and every campaign, you definitely shouldn’t just limit your digital calendars to your work meetings and personal to-dos. Instead, create a completely separate e-calendar strictly to keep track of each individual client’s advertising campaigns. 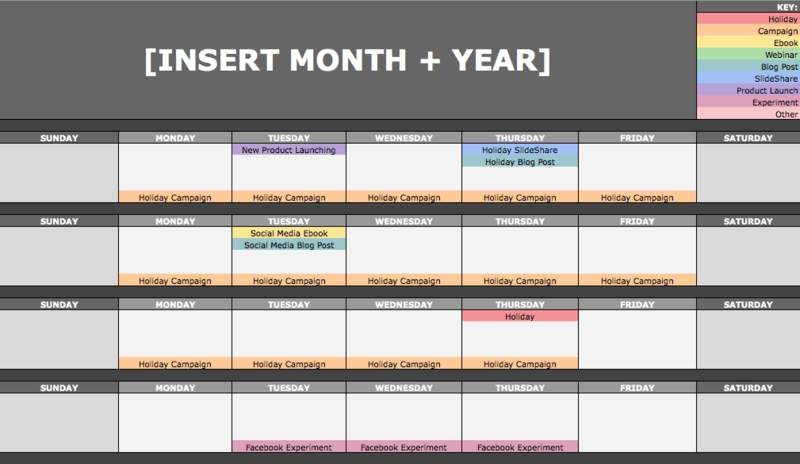 Take this content calendar example many writers use to note important content piece releases and promotions. 1. 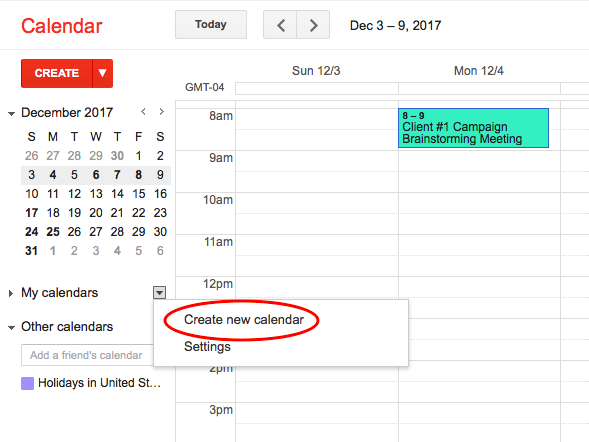 First, go to your Google Calendar, and select “Create new calendar” under the “My calendars” dropdown arrow on the left-hand side of your screen. 2. You’ll then be directed to a page where you can fill in various details regarding your calendar. 3. 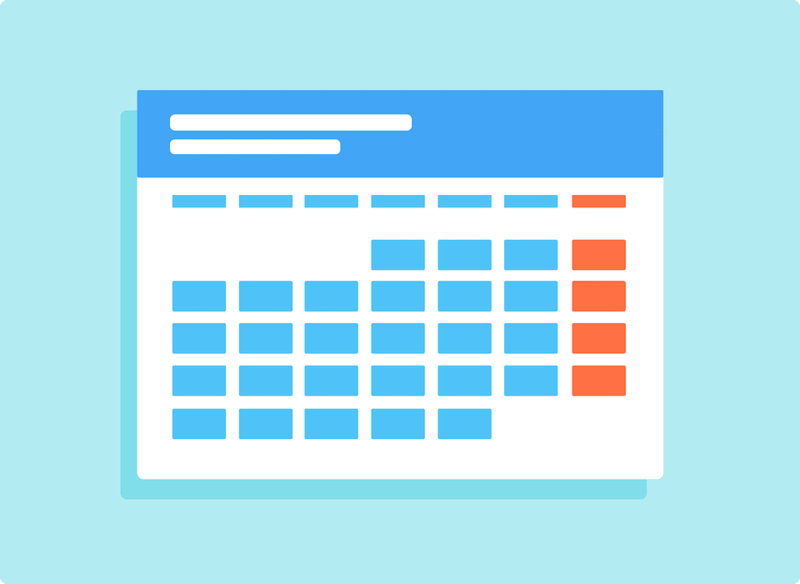 From there, you can begin creating various event “due dates” based on your ad campaign process and schedule, helping you never miss a deadline or screw up in another way (like forget an in-person meeting). These event “due dates” can be centered on things like campaign brainstorming meetings, campaign creation—finding an image (or image options) and creating a small amount of copy, revision rounds, final review, promotion schedules, check-in meetings, results deliveries, and anything else you’d never, ever want to forget. You can even go as far as creating a color-coding system to make it easy to identify these events. 4. 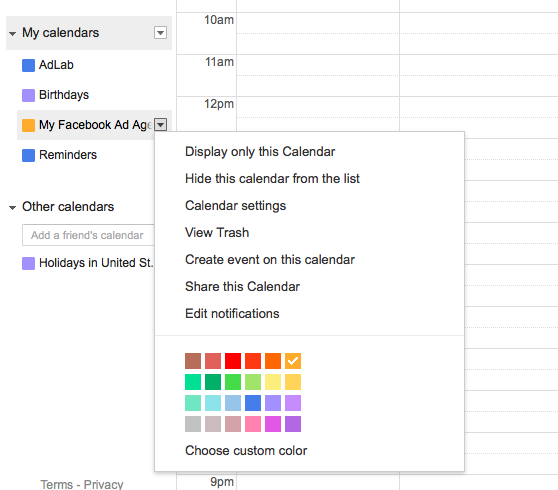 Now, at first glance, you might notice another one of your Google calendar’s is making things a little hazy for you as you’re adding new events to your “My Facebook Ad Agency” calendar. Not to worry, though. You can remove these from your calendar view by directing your eye to all of those listed under the “My calendars” section on the left-hand side of your screen. 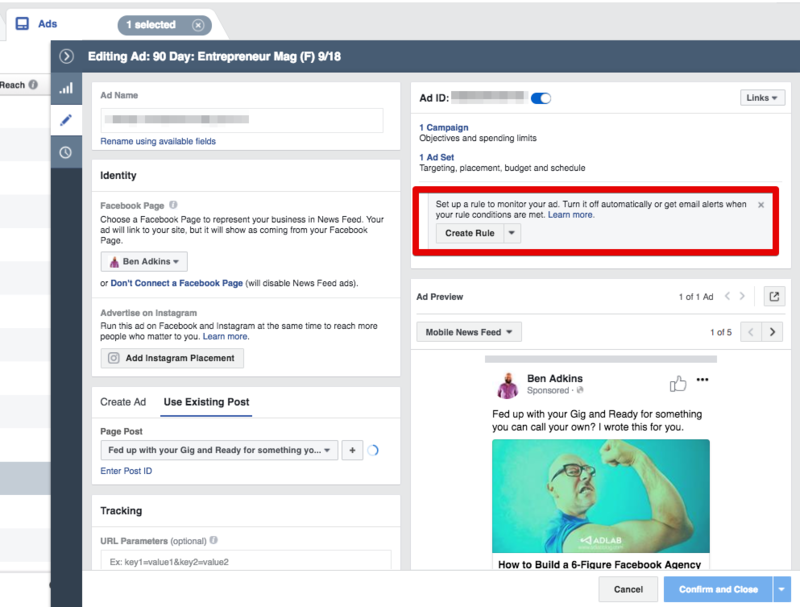 In this example, we can hover over the “My Facebook Ad Agency” calendar and click the dropdown arrow > “Display only this Calendar” to keep you laser-focused on your agency tasks. How easy is that? Nothing beats a little organization via a digital calendar. It’s a great tool to better manage deadlines and relevant project data for yourself (and even your clients if you choose to share with them). 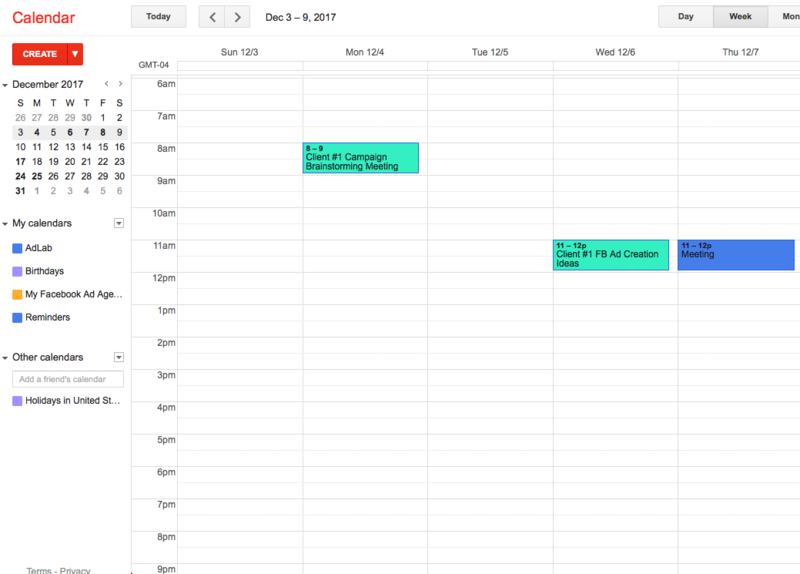 If you're a document-loving person, check out this awesome alternative to the Google Calendar—CoSchedule's Marketing Project Management Calendar Template. 2. 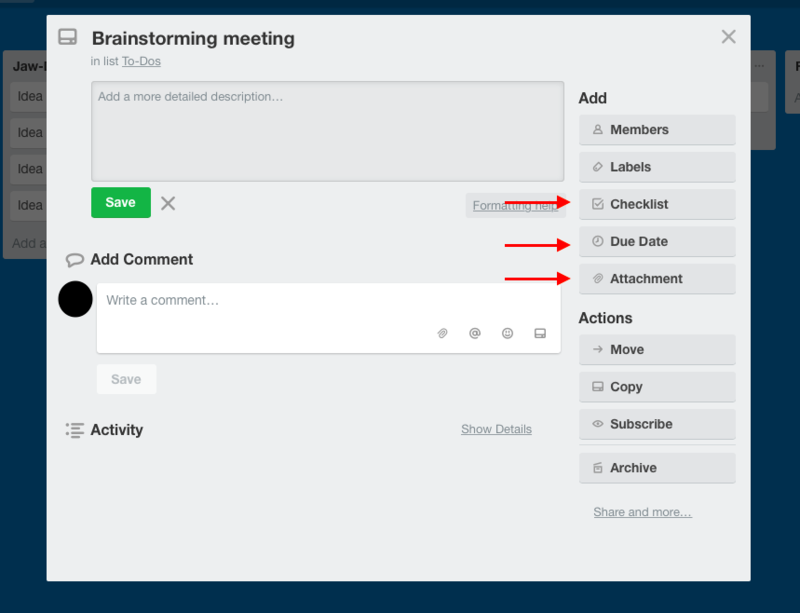 Jump on Trello to organize client communications. Email is a key tool for client communication. I’m not going to argue that. But, as things get rolling and you start adding more people to your list, the last thing you want is for any important messages to disappear into the abyss in your inbox. That wouldn’t make a client very happy if you didn’t give them the attention they deserve. And, maybe you also don’t want to encourage them to go MIA on you when it comes time to wrangling their feedback on campaigns and responses to your questions. So, what’s the solution to preventing both of those things? Trello. It’s an easy, free way to manage and organize your client campaigns and communications—from checklists to documents, deadlines, and more. And, it’s HUGE right now in the world of business. My guess is that it’s here to stay. We use it often in our day-to-day here at AdLab because it allows us to break through all the inbox noise and get quick responses. 1. Create your own Trello account here. 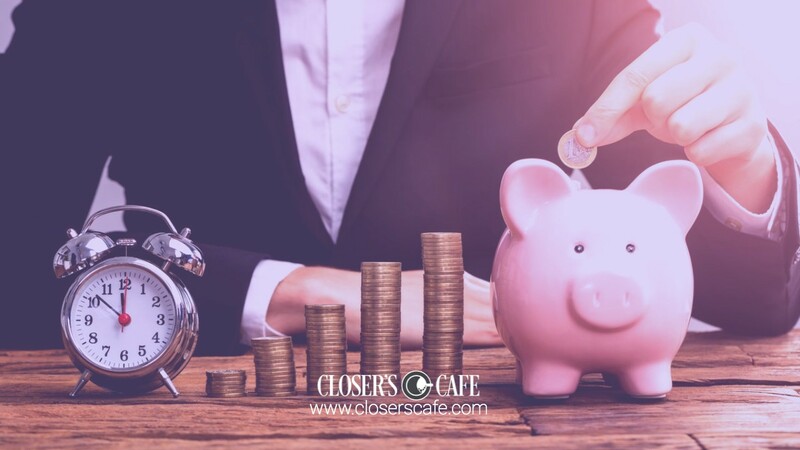 Client resources—keep track of things like signed contracts, out of office dates so no one bombards your email while on vacation (and vice versa), and even contact information. Results reports—we’ll get into when you should send these in a minute,. But, as soon as you’ve pulled the week’s results (and the month’s) regarding an ad campaign’s performance, upload the document to this list, which can be organized by date. To-dos—this list can include anything from client brainstorming sessions, campaign creation tasks (ex. Find image via stock.adobe.com, crafting copy, etc. ), revision round(s), setup ad in Facebook, and more. Ready for client review—you have the ability to drag and drop any card within a list (ex. “Craft ad copy” under the To-dos list) onto another list (Ready for Client Review). More in a minute on how you can let them know the task is ready for their feedback. Completed—once a task has been reviewed and completed, you can move it to the “Completed” list, helping you keep track of all you’ve accomplished. 4. Now, within each list, anything you add to is called a “card.” You can open a card and add comments (tagging a client), upload related documents, create checklists, add labels and due dates, and more. 5. Lastly, when your board is ready for the spotlight (aka to share with your client), you can invite them via email to add them as a member and begin tagging them in comments. Best of all, this isn’t just for your desktop. You can download the free Trello app on your iPhone, iPad, Android, or tablet to keep track of your projects while on the go. What’s that I hear? Is that the sweet, sweet sound of you breathing a huge sigh of relief? I figured. After all, organization is vital to your success and clients’ happiness. And, Trello will help you bring home the gold in that category. Also, it’s important to note, I’m not saying you need to replace email completely. But, when you add this platform to your list of tools for your Facebook advertising agency, you’ll find it easier than ever to keep things running smoothly. If I’ve sold you on it, check out this video that gives you an in-depth tour of all its capabilities. 3. Make Facebook Business Manager your best friend. Do you dread the idea of having to ask yet another client to share login information with you or friend you on Facebook just so you can get admin access to their Facebook page and begin running ads? Yeah, I’m with you on that. As your client roster starts to creep up in numbers, the last thing you want is for all those pages to begin consuming the left-side of your News Feed. And, it makes it extremely difficult to keep track of the plethora of pages you do have access to in order to run campaigns successfully. But, there’s a tool that’ll help you avoid all of that! It’s called Facebook Business Manager. It’s what all the top marketing gurus suggest using when it comes to managing multiple clients for your agency. And, we couldn’t agree more. In it, you can see everything in one place—all the pages you manage Facebook ads for—and there’s no need to break privacy boundaries between you and your clients. If you’re curious on how to get it set up (in less than 10 minutes, no less), check out this post we wrote specifically for that reason. Here’s a tip for you: just be sure when you’re running ads for clients for their business, you’re doing it from a persona page. It’s something we’ve referenced many, many times before. Learn more about it here. Let’s be honest, your time is precious. 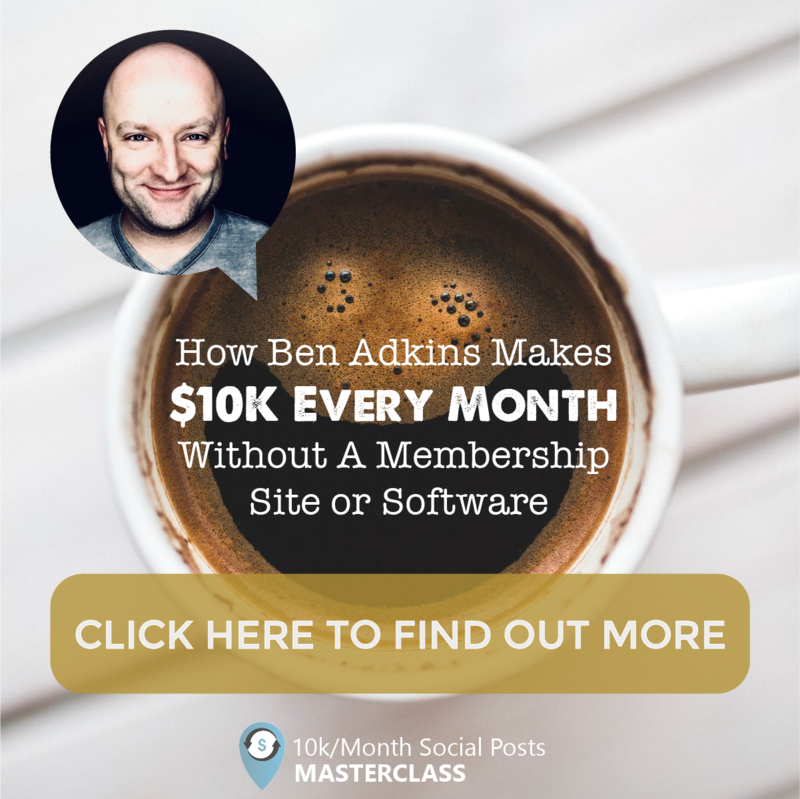 You started your own Facebook ad agency because you wanted more freedom to live the life you’ve always envisioned for yourself. Yet, as you add more clients along the way, I’m sure you’re curious about how you can avoid letting all the little tasks bombard your day. Am I right? I thought so. Not to mention, it’s not easy to keep track of how each each and every one of your campaigns is doing. So, what’s the key? Automation! You might envision scheduling out social posts when you hear that word—whether it be through Hootsuite, Buffer, or another similar platform. But, no, automation isn’t just for that. It’s also for Facebook advertising. How so? 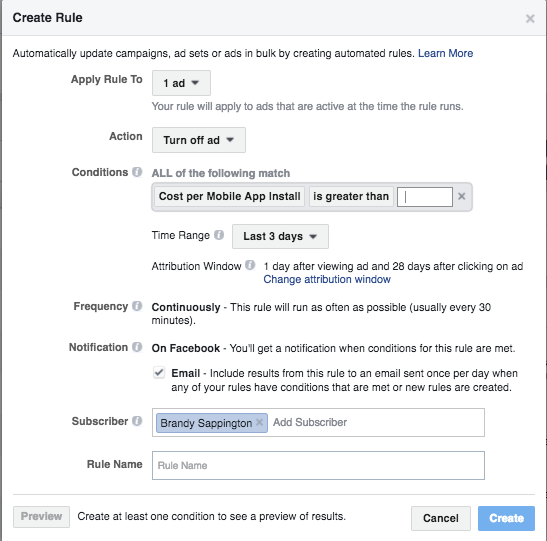 Well, for starters, when you set up your client’s ad, you can create an automated rule in your Ads Manager to receive a performance alert straight to your inbox whenever a campaign, ad set, or ad creative is experiencing a positive or negative trend (high/low click-through rate, budget spend, CPC, etc.). You can also set up ad set spend pacing alerts whenever ad sets are trending towards overspending or underspending of your total monthly budget. And, even optimization rules such as pausing any ad that reaches a frequency of 5 ad views. 1. Go to your Ads Manager. 2. Click to check the box next to the campaign, ad set, or ad you’d like to apply a rule to. 3. Click Create Rule. A new window will appear where you can set up your new rule. 4. In the Apply Rule To section, open the dropdown menu and select where you want the rule to apply. 5. Then, in the Action section, open the dropdown menu and select what you want your rule to do when your campaign, ad set, or ad meets the rule’s conditions. 6. In the Conditions section, choose a condition that triggers your rule and then click Add. To add additional conditions, click the + icon. 7. If you want to adjust the number of days of data to gather in your rule, open the Time Range dropdown menu and select a time range. If you want to track the number of actions taken on your ad during a particular time period, click the Change attribution window and select your attribution windows for views and clicks. 8. Confirm the type of notification you want to receive. You always receive notifications on Facebook for your rules, but you can click the Email box if you want to receive an email as well. 9. Enter a name for your rule, and then click Create. Your rule is now active, and you can track all rule activity in Automated Rules! Ultimately, automation puts more control in your hands. 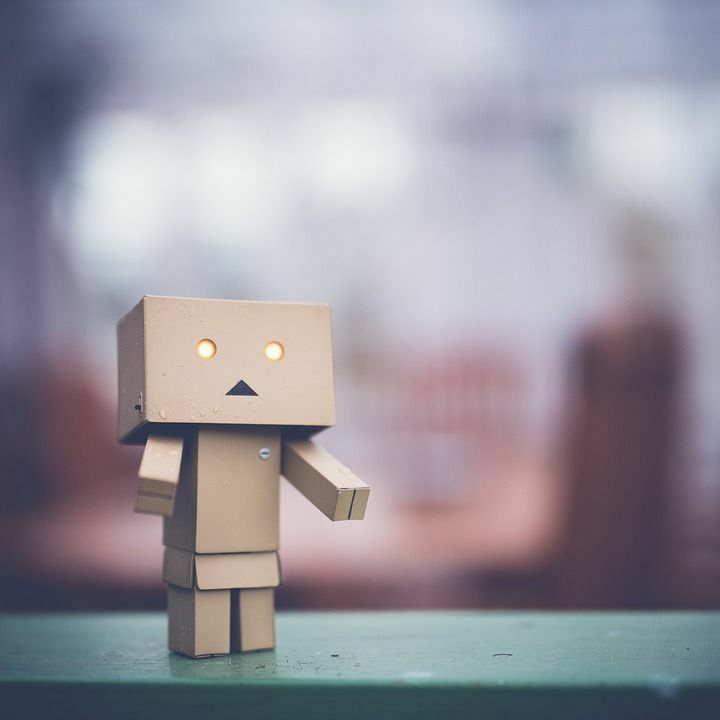 Rather than checking the performance of each and every ad you’ll end up running, automation can run simple checks for you and take the actions you’d normally do manually. What a lifesaver! 5. Keep your days straight. Things start moving fast when you have more than one client on your side. And, it’s very easy for the days to start blurring together, making it easier for you to waste time and energy—especially if you don’t have a strategic process in place to manage your ad campaigns wisely. Login and check each client’s ad and click costs. Check your call tracking data in CallRail. Take a look at your heat maps if you’re using anything to watch what’s going on, on the page. Check for client emails or notifications on Trello and respond to them. This should not take more than an hour or two a day once you get rolling. Compile the week’s data for each ad and send it to clients by the end of business via Trello (or email if you prefer to stick with that). They can walk out of the office knowing what you did that week. Ask each client to let you know how those leads turned out in the office. 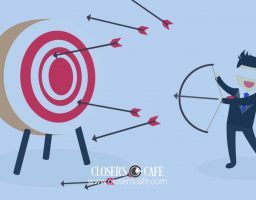 As you get into the groove, you’ll be able to identify whether or not the load seems to be too much with five or more clients on your side. And, if that’s the case, it may be time to hire a virtual assistant to help with some of the day-to-day tasks. If you’re unsure of where to start, we’ve paved the way for you in this post on how to hire the ideal VA for your digital marketing agency. 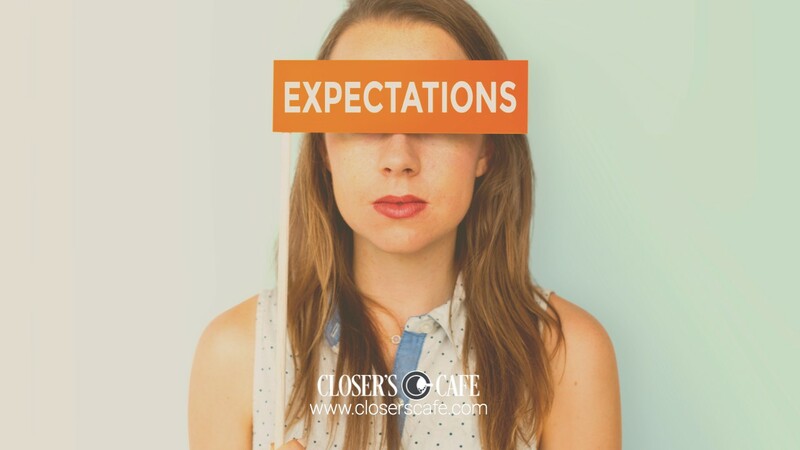 You’ll definitely want to check it out as it may be of value to you sooner than later! 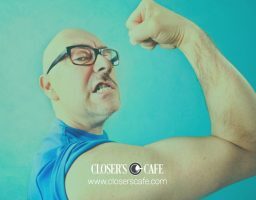 Even if you happen to be a not-so organized person, managing multiple clients and Facebook ads isn’t as difficult as it seems, especially when you have top-notch tips to put into action and into your client management toolbox. 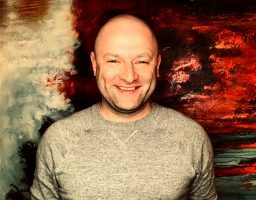 And, I promise you, as soon as you implement these methods, it’ll be even easier for you to continue surprising and delighting each business owner you get the chance to work with. Best of all, if you’re craving more information like what was shared here today, we’ve got just the thing: AdLab—an ever-evolving ad strategy course on all things Facebook advertising. Join now to grow your agency and generate profit for years to come. Have questions or something to share about managing multiple clients? We want to hear it! Drop us a message in the comments section below.